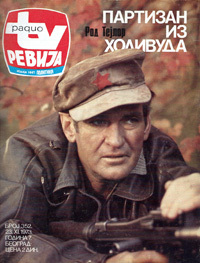 Rod Taylor plays Marko, a leader in the partisan forces (Partizani) that opposed the Nazis in Yugoslavia during WWII. There are several versions and titles for this project. The director, Stole Jankovic, started it as "Partizani," a three-hour production for Yugoslavian television. It was later condensed to a feature-length version known as "Tactical Guerilla" and "The Last Guerilla." The U.S. home video edition is titled "Hell River." The movie was shot on location in Yugoslavia with a significant amount of editing and post-production happening in Rod Taylor's garage in Beverly Hills. It's based on a true story, and history reveals that it's a story worth telling: In April 1941, Yugoslavia was overwhelmed by the German blitz, and the army surrendered. But the Yugoslavian partisans -- a formidable guerilla force -- fought on. Hitler's rage against the partisans resulted in Operation Punishment, a brutal campaign that targeted Yugoslav civilians. The German army took plenty of punishment in return, from the stalwart partisans. The film doesn't tell the story all that well, but it does give a sense of the overwhelming odds the partisans faced. Explosions, guns and tanks abound amid bleak conditions. Adam West, the 1960s TV "Batman." He plays Kurt Kohler, an Austrian man who is a reluctant German soldier. He becomes Marko's rival in love and war as they face each other in battle and vie for the affections of the lovely Anna Kleitz (played by Xenia Gratsos, who is also known as Brioni Farrell). Peter Carsten, who co-starred with Rod in "Dark of the Sun." 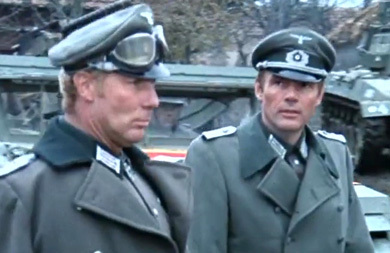 He plays a Nazi again, Colonel Henke. 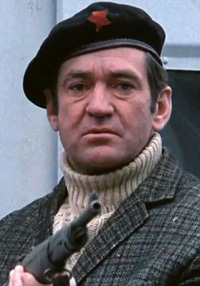 The film also had "the whole Yugoslavian army" at its disposal, according to Rod, plus 10,000 "extras" from the towns and villages where filming was done. "Most of the time we were billeted in army barracks high in the mountains, sometimes in weather 30 below zero." Rod said about the location shooting. "Our nightlife was being invited to dinner by the farmers who would roast us a pig in a brick oven and share their bread and booze with us." Director Stole Jankovic originally intended to make "Partizani" for Yugoslavia television. Jankovic actually had joined the partisans in 1941 and later became a member of the Communist Party under the Tito regime. The idea to make it into a feature film came from Ika Panajotovic, a one-time Yugoslavian tennis champion who had moved to the U.S. and worked in law and film production. Panajotovic, in turn had a connection to Rod -- the two men played tennis together. He got Rod to come aboard the project, giving the project a lead actor who was still a "saleable commodity." Filming started November 1973 and continued much longer than scheduled. Tragedy struck on March 5, 1974. Fred Hakim, one of Rod's closest friends and associates, crashed his car while driving en route to a mountainous night-time shooting location. Rod was deeply affected by the death of a man who was very much like a brother. Rod dove even harder to work on the project. He called in Michael Economou, film editor from "The Deadly Trackers," to supervise post-production. Rod converted his garage into an editing room and poured in more of his own money to fund it. 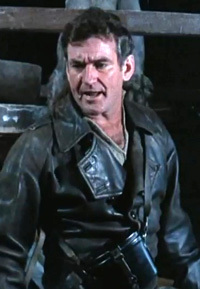 Rod even wrote an additional scene for the film, which was shot on a ranch outside Los Angeles. It's a romantic interlude in which Marko assures Anna that the fighting can't last forever and that "Hitler will run out of Germans sooner or later." Much has been made of Quentin Tarantino helping to elevate "Dark of the Sun" to cult status. "Partizani" can bask in that glow as well. The two movies made up a double feature during Quentin Tarantino's March Madness event in 2011. 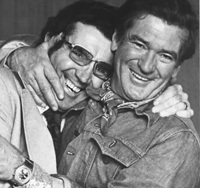 They were screened on Rod Taylor Night at Tarantino's New Beverly Cinema in Los Angeles. The blog site Schofizzy.com has an extensive overview of the double feature and notes that Tarantino's personal print of "Partizani" was used. "The film really is a lengthy showcase of Taylor," the blogger wrote. "Fans of him are sure to be satisfied with his hunky performance as the Partisan soldier, but those seeking an action-packed war thriller could walk away a bit disappointed." The writer summed up the film as "a thoughtful take on the Yugoslavian plight during WWII mixed with a love story." 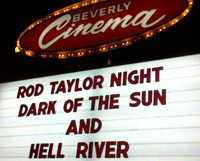 Rod Taylor Night, with Dark of the Sun and Hell River, 2011.